After an intense few days of service and eye-opening cultural experiences, the group spent the final day of the trip at the beach. It was a relaxing conclusion to the week, and highlighted the beauty of the Haitian coast. 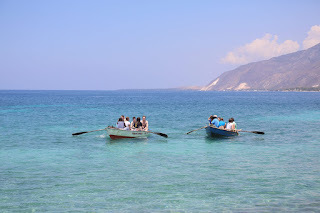 The entire group took boats to a nearby coral for snorkeling, and many of us saw a variety of caribbean fish and jellyfish. 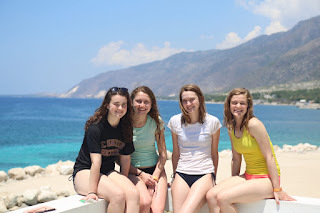 Many of us had wrestling matches on the water trampolines, drank tropical smoothies, tried fresh crab, and most importantly enjoyed the incredible view with minimal sunburn. After a beautiful and relaxing day at the beach, the group took the tap-tap to the famous Fleri (aka McFlurries). We indulged in pizza and amazing mango creme brûlée. On our tap-tap ride home, we shared our best riddles, told our dumb stories, and laughed all the way back to the guest house. Later in the night, we reflected on our unforgettable week in Haiti. 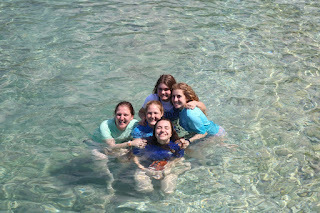 We built relationships with each other and the Haitians, experienced a new culture, and served those who needed it most. We are enjoying our last night in Haiti and getting ready for church in the morning with the Sisters of Charity and a long day of travel.